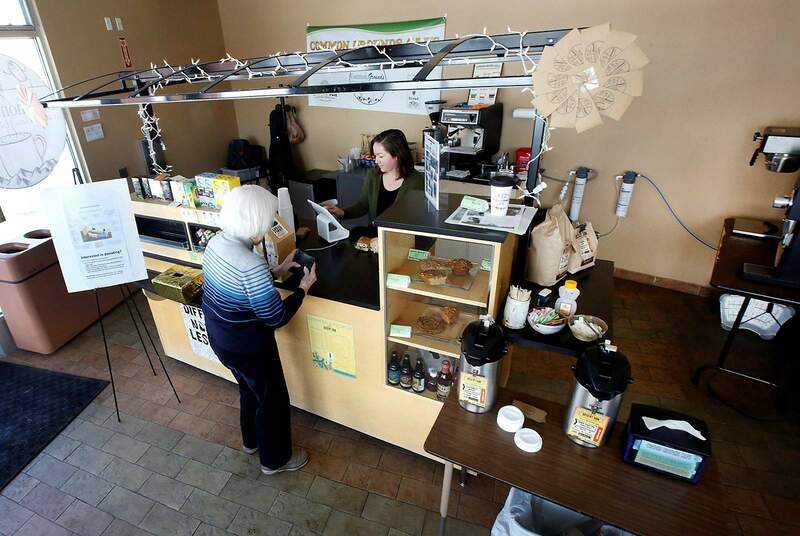 Corrie McCarthy, a paraprofessional who runs Common Grounds Café inside the Durango Public Library, helps a customer. Common Grounds, which prepares students with special needs for the work world, is raising money to make upgrades. Many have tried and most have failed, but for Common Grounds Café, the Durango Public Library has been the ideal location for a café designed to prepare students with special needs for the professional world. The café, staffed by Durango School District 9-R students, is holding a fundraiser to purchase a permanent café counter and upgraded utilities in an effort to expand operations and provide opportunities to more students. Special needs students have been serving coffee at Common Grounds Café for about five years, working in every position from bus-person to cashier to barista to manager. Corrie McCarthy, a paraprofessional who runs Common Grounds Café, said for a lot of students, this is their first step into the professional world. The coffee cart in the library has seen some wear and tear in the past few years since Common Grounds Café opened, Parson said. Staff have noticed some things that could be changed or improved, like installing a double-bay sink, improving electrical input so the breaker doesn’t go out every time the café gets busy or adding a high-pressure dishwasher. Common Grounds Café is looking to raise $30,000 by May to finish construction of the permanent café by the start of the 2019-20 school year, Parson said. The Friends of the Library and the Library Advisory Board both have money set aside to help pay for the project, said Sandy Irwin, Durango Public Library director. If Common Grounds Café doesn’t raise enough to pay for the permanent structure, the library organizations will pitch in, she said. Corrie McCarthy, a paraprofessional who helps run Common Grounds Café, said the coffee shop at the Durango Public Library is a stepping stone for many special needs students as they seek employment in the community. All the support that Common Grounds Café gets will go toward improving the work experience for 9-R students who work there. 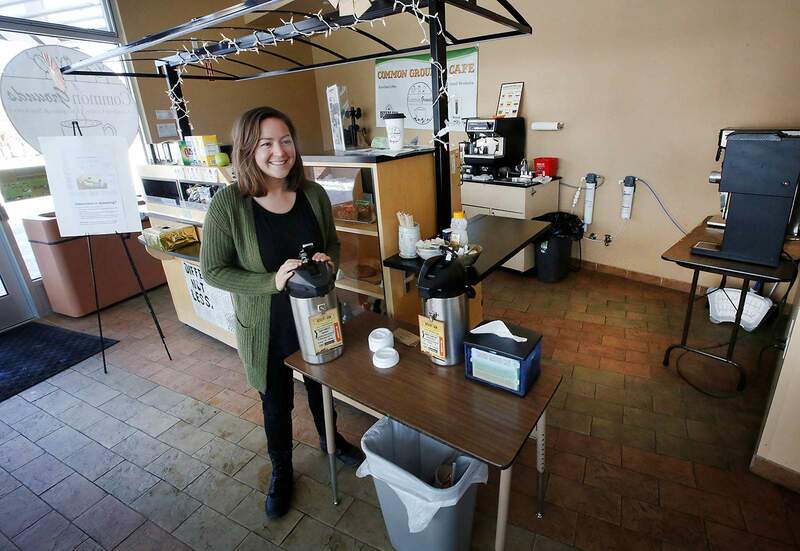 And any new upgrades would increase Common Grounds Café’s capacity for student employees, said Cara Kropp, Durango High School transition coordinator. Many Common Grounds employees go on to obtain service jobs in Durango, McCarthy said. “One successful outcome is all the students who do go out into the community afterwards and maintain jobs and independent living,” she said. Anyone interested in donating to the Common Grounds Café fundraiser can check out a GoFundMe page created to make donating easier, or people can donate in person at the library. Checks can be made to Friends of the Library with Common Grounds Café in the memo. “The beauty is we have a lot of regulars who have asked how they can give back,” Parson said.